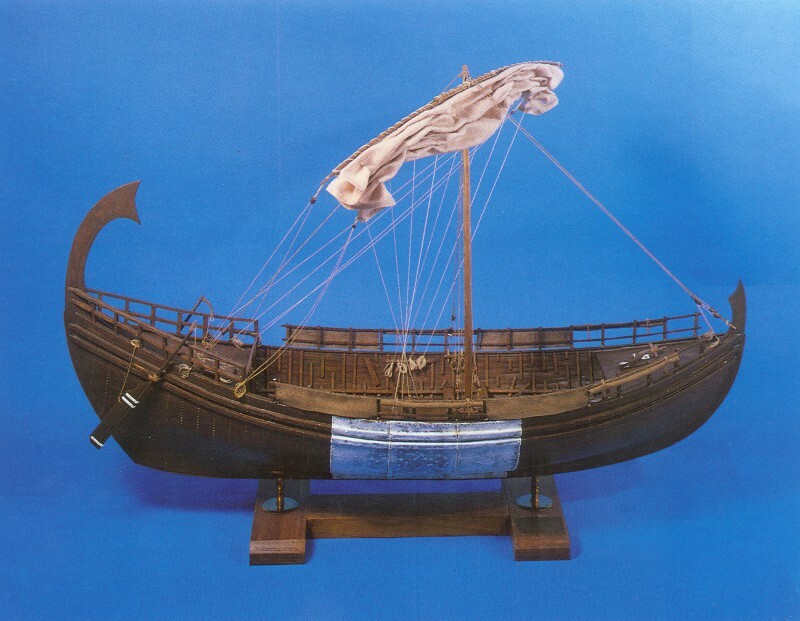 Bronze Age: Exhibits related to the Minoan maritime history, such as shipbuilding tools and a model of the representative ship of the Minoan period. 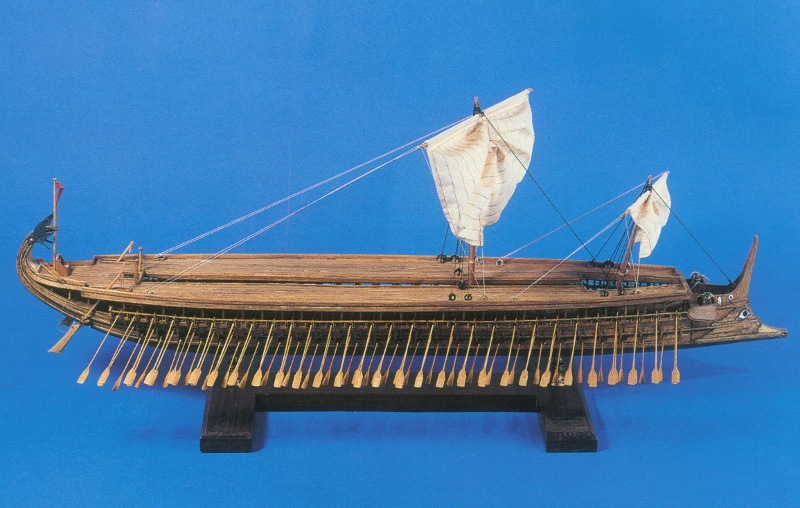 Iron Age: Models depicting phases of the Naval Battle of Nafpaktos, of Salamina and Mikali. Models of bireme and Athenian trireme, of roman trireme, the Keryneia Ship and lastly the map of Great Alexander's Campaign. A dummy of Athenian Bireme. Two rows of oar, the plunger and the characteristic eye on the bow are distinguished. According to Herodotus the two-rows (two rows of rovers) were devised by the Eritreans of Asia Minor, settlers of the Boeotians. Such ships were used by the Boeotians in the Trojan War. 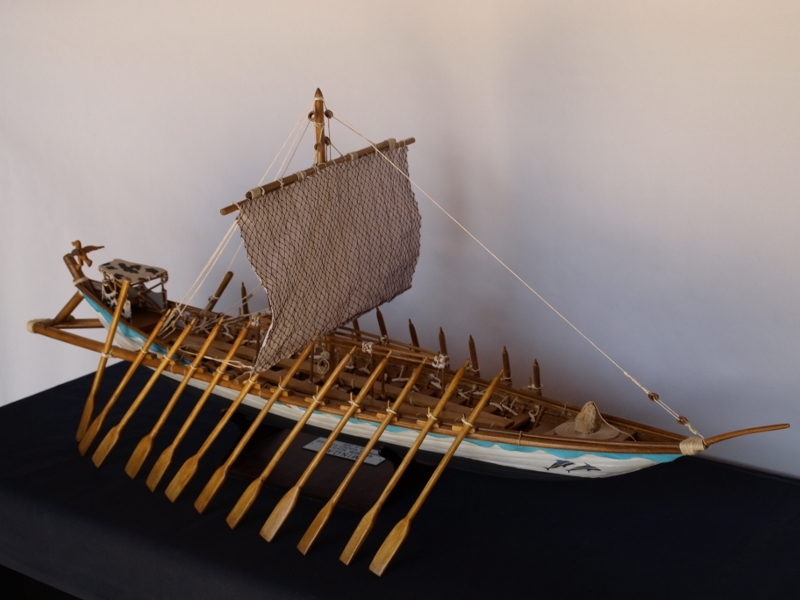 There were biremes with 30 or 50 oars. The front part of the keel was lined with metal plates to lift it to land without damage. The bow ram was the main weapon. The length was 18 m, the width was 3-3.6 m and the displacement was 22 m. A 50-oars ship developed a 6-knot speed. Unique square sail, deck shaped to carry the battered parts. It was the precursor of the trireme. The main warship of the Athenians that prevailed thanks to its nautical virtues. Light and fast sailing ship with a strong ram bow. Typical was the concentration of a large number of oarsmen, about 170 (in three overhanging rows) that were never chained slaves but free and proud Greek citizens. It had a small draft and broad bottom (instability, but agility) to move in comfort and to the shallow. 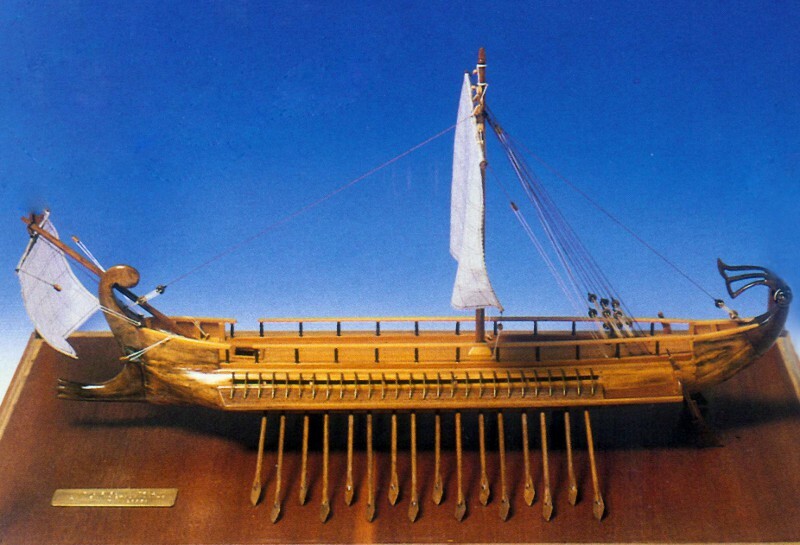 The sophisticated trireme had an elevated deck for the soldiers and archers who constituted the fighting force (spear, javelin, bow, sword). Small was the displacement, for reasons of flexibility, about 60-70 tonnes. The length was about 150 feet. It basically had a main sail, and not always, a smaller one on the bow with a similar sized square sail. A lightweight, fast and powerful forward-looking boat saw the originality of gathering more paddlers and hence increased the propelling power without increasing its length accordingly. The Corinthians first devised this type of ship. It began as a tool in the hands of Themistocles for the victory over the Persians. Continuing its glorious career and constantly evolving, it has made a decisive contribution to the spread of Greek culture.